1974. Of iron stakes (figs. 546. to 554.) there are a great variety both of cast and malleable metal. Figs. 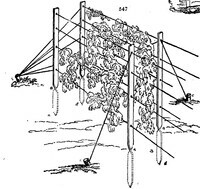 546. and 547. show the application of flat wrought-iron stakes and wires to the support of peas or other annual plants. Each stake is twisted cold at the point (a) just above the surface of the ground to an angle of 90ï¾¦, by which means it opposes its flat face to the earth in which it is stuck (a a), and that in the proper position to resist any motion in the hedge sidewise. The connecting cords may be either of wire or twine; when they are for sweet-peas, to be sown every season, they may be permanent, and of wire; but when they are to be removed they should be of twine, boiled, previously to being strained, in a solution of Indian rubber in pyroligneous ether (a product of the pyroligneous acid-makers, and known on the Continent by the name of pyroxylic spirit). The expense of this is trifling: 1.5 oz. of Indian rubber, and 0.5 pint of the ether will saturate 10 lbs. of twine. The twine need never be varnished again, and will last many seasons; is perfectly impervious to wet, and is not affected by hygrometric changes in the atmosphere; so that, when once strained tight by the stakes at b, it will remain so. The stake fig. 548. is 7 ft. long, and weighs 1 ewt. 8 lbs. per dozen. Fig. 549. is 5 ft. 2 in. in length, and weighs 2 qrs. 13 lbs. per dozen. Fig. 550. is 3 ft. 8 in. in height, and weighs 3 qrs. 9 lbs. per dozen. Fig. 551. shows the four sizes of cast-iron stakes manufactured by Messrs. Cottam and Hollen. The height of the first (a) is 7 ft., its weight per dozen 2 cwt. 1 qr., and the price per dozen 25s. ; b is 6 ft. high, weighs 1 cwt. 2 qrs. 22 lbs. per dozen, and costs 18s. 6d. ; c is 5 ft. high, weighs 1 cwt. 1 qr. 16 lbs. per dozen, and costs 16s. 6d. ; and d is 4 ft. high, weighs 40 lbs. per dozen, and costs 10s. 6d. Fig. 552. shows the different sizes of wrought-iron rods let into cast-iron sockets at the bottom. The height of the first (e) is 6 ft. 6 in., and the price is 10s. 6d. per dozen; of the second (f), 5 ft. 6 in., the price is 9s. 6d. per dozen; of the third (g), 5 ft., the price is 8s. 6d. ; of the fourth (h), 4 ft. 6 in., the price is 8s. ; of the fifth (i), the height is 4 ft., and the price 7s. ; of the sixth (k), the height is 3 ft. 6 in., and the price per dozen 6s. Qd. ; of the seventh (l), the height is 3 ft., and the price 6s. ; of the eighth (m), the height is 2 ft. 6 in., and the price 5s. 6d. ; and the ninth (n) is 2 ft. in height, and the price per dozen is 5s.